Any country’s future and economic growth relies on the success of Micro, Small and Medium Enterprises. Their reinvention, innovation, and quality outputs affect more on the society. Benchmark Trust feels very proud to value their ideas and their potential for the society and therefore, we get inspired to introduce INDIA 5000 Business Awards and from this award, one can distinguish himself/herself from others as a quality outcome provider. INDIA 5000 acknowledges the best 5000 young entrepreneurs and MSME companies for their achievements and quality outcomes. 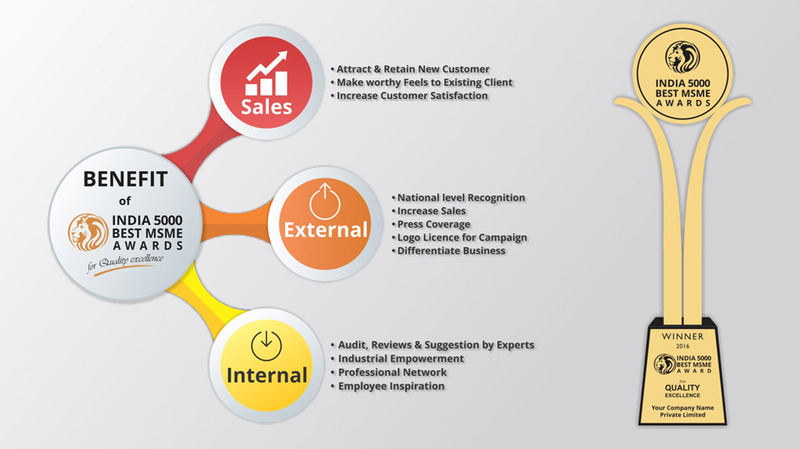 When an end user wants to get quality products, services and outcomes from the search-box click, they can use the list of INDIA 5000 Business Awards. INDIA 5000 is working on the direction where the end user who wants to get quality outcomes as per their requirements, it might be for the management, services or products. The end user can get the list of the best companies from INDIA 5000 which provide the best products, services or management in India. INDIA 5000 Business Awards are given to the people or companies only who fulfill all the criteria set by Benchmark Trust and TQV, their Audit Partner. INDIA 5000 follows these selection criteria to choose companies and personnel for INDIA 5000 Business Awards. Just go through them carefully and you will understand how refined the selection procedure is for INDIA 5000 Business Awards. How much importance you give to your customers and the quality output you offer for the customer’s satisfaction? How you lead your team to achieve your objective with employee’s professional growth? What innovative concepts and benchmarking you have? Do you make continuous improvements and performance evaluation? What is the impact of your out comes on society? Which process strategies and methodologies you follow? What are the future expansions in line with your Vision and Mission? What are the achievements of your services, products or management if any? Initially, we invite applications for all our awards categories and all the applications go through the application screening procedure to check the authenticity of applications. All the applications should be submitted in the required format with required documents attached. After getting all the applications, we start our verification process where all the submitted applications and documents get verified for the authenticity. After the verification process is completed, we shortlist the candidates or companies and send them confirmation about their selection for INDIA 5000 Business Awards. After sending the selection confirmation, our team will visit your premises if required for physical verification and confirmation of the company and its workings. After document verification and premises visit, your application goes for final evaluation. The winners get informed through mail with all the further procedures and proceedings. After selection of winners, we publish the final list of INDIA 5000 Business Awards winners. 01. Who is Eligible to Apply for the Nomination? Any Proprietorship Business, Partnership Business, Government Registered NGO, Private Limited Company or Limited Business Holder can apply for the nomination of INDIA 5000 MSME & Business Awards. For the personal categories, individual person of the concern field will be considered as eligible. 02. How to Submit the Nomination? If you are eligible to apply, you can be a part of INDIA 5000 Business Awards we are happy to serve you! You can fill up application form given online on our website. If you want to take part as a MSME or an entrepreneur, go with business registration option in Nomination bar dropdown list, or else go with the Individual category registration option if you want to take part as an individual in the INDIA 5000 Business Awards. 03. What Documents I Need to Submit? 04. What is the Process of Award Selection? Primarily, we request applications for all the awards categories and those applications undergo the application screening process to check the authenticity parameters.In verification process, all the applications and documents get verified for their authenticity. After the completion of the verification process, we select the applicable candidates or companies and send them confirmation about their selection for the INDIA 5000 Business Awards. After sending the confirmation of selection, our team will visit your premises if needed for the physical verification and validation of the company as well as its workings. After verification of documents and premise’s visit, your application reaches the final evaluation stage. After the last evaluation, our selection committee will do the final assessment to select the winners and those winners will get informed through mail with all the further proceedings and procedures. After selection of winners, we publish the final list of INDIA 5000 Business Awards winners. 05. How Many Types of Awards Are There? To know more about the types of awards, please visit the Nomination page. 06. What About the Privacy of My Information? It’s a very obvious question and we understand your concern fully. But don’t worry as your information privacy is our key responsibility. Your personal information will never be disclosed anywhere. Your information will be used only for the selection when we will list out your profile information on our listing and if you are awarded, this will help you to promote your quality services or products in market. 07. What are the Benefits for the Winners of INDIA 5000 Business Awards? You will get NationalLevel Recognition. You can attract new customers and retain the older ones. You will have increase in sales. Your client will feel worthy to be your existing client. You can increase the customer satisfaction. Your employees or staff will get inspiration from the Awards. You will get industrial empowerment with the help of these Awards. You can differentiate your business from other with these Awards. You can use logo license in your campaign materials. Your audit will be done by the industry experts. You will get reviews and suggestions from our audit team if needed. You can create a buzz in your professional network with our Awards. 08. When Will the Award Winner’sList Be Announced? The award winner’s list will get announced usually in June for different categories. 09. What About the Sector Categories-wise Fees? To get more information on this, please view our Fees page. 10. What is the Deadline to Submit Nomination Application Forms? You will get updates about the deadline of submitting the nomination application forms on the INDIA 5000 website. 11. What If I Still Have More Questions or Queries? 12. Can Some Other Individual Submit Information On Behalf of Others? We appreciate that if want to serve or help others by filling the nomination application on behalf of others. Whatever you are doing is worth doing! Just go ahead but before doing that takes the written approval from one on behalf of whom you are submitting. 13. Will My Competitors Get Any Information About Me or My Business Which I have Shared with You? We understand that it’s a quite obvious question. But don’t worry at all as your competitor will never get any personal information about your business. They can see only your profile related general information whatever you are sharing to public to promote your business. So we only list general information for professional growth of your business. We always take care about your professional growth. 14. What is INDIA 5000 Yearly Conference? INDIA 5000 yearly conference can be held in any metro city of India every year. The objective of this conference is to provide platform to the INDIA 5000 Business Awards winners of different category awards. Also, the INDIA 5000 yearly conference will consist of celebration for the INDIA 5000 award winners, where winners can get their awards from the guests and important invites. 15. How to Take Part in INDIA 5000 Yearly Conference Celebration? Only selected award winners can take part in the INDIA 5000 yearly conference celebration and take their awards from the honorable guests.Interested winners can contact INDIA 5000 for their registration for the celebration event. Note: For the Award celebration event participation, you need to pay privilege charges. 16. What Will Be Included in the INDIA 5000 Business Awards Kit? A Solid concrete base starts with your Name on the trophy! Nothing is more important except strong concrete base to stand anywhere. This represents Growth, Solid Foundation & Strong Vision to grow. B You can get your name carved to the strong concrete base as well! This represents your identity, hard work and dedication towards your brand which will make your name worth on the trophy! C As everybody starts their professional journey from the scratch, the two golden pillars in the trophy represents your growth from the scratch to higher levels. D These two pillars touching one worthy round which is the topmost part of the trophy and it represents that the individual who has started their journey from the scratch, can also achieve the topmost and valuable position in any professional field. E Touching the turn represents that achieving this fame will change your path into a smoother one with endless professional growth! It represents a full circle of life, where one has to start and end at some point however, what’s important it the journey! Once you get a logo you can use our logo for your professional growth. We provide you a platform to develop your quality business more and more so, for the same, you are free to use the logo, but there several things that you need to keep in mind whenever and wherever you want to use the logo. You agree not to alter the logo in any way, shape or size ratio and colour. That means you have to follow same extension, graphic for use of the logo. The year in which you get a logo you need to clearly mention the use of your business promotion about in which year you have received this else you can take advantage of this for a lifetime. Use of logo in your website should have redirection link that will redirect users to our website when they click it. Or you can give a link in backend to the transfer user to your article or your profile on our company website. You need to check the proper usage of logo when you are using it whether it is going in ethical way or it may cause harm to its brand value!